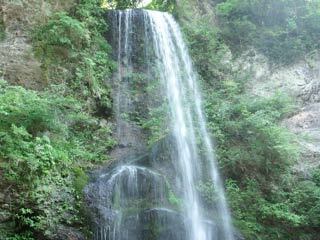 Yuhi Falls (夕日の滝) is located on Ashigara Mountain. It literary means sunset falls because it become so beautiful at Sunset. It has 23m high and 5m wide. "Kintaro ( 金太郎)," who is the hero of one of the most popular fairy tale in Japan, was born here. There is his house and play ground around the fall. Currently, there is camping space. In January 15, Sun passes in the center of the fall. In Summer, many people visit here to enjoy camping and BBQ.